Ultimate Guide Dicas sobre a cidade Pai no norte da Tailândia - Guia Mochileiro - Tudo o que você precisa saber para viajar e conquistar o mundo. to know the practical details of the trip to this city, you are in the right post! Lets Go! You will probably be in Chiang Mai, and from there go to Pai. Several agencies offer the hourly route, van, for 180 baths (about 14 reais). There are times that it’s crowded so it’s good to book at least a day before. The hostel where I stayed in Chiang Mai, Julie, also offers the route. Pai is a few hundred km from Chiang Mai, but the journey takes about 3h30 or more, because the road is full of curves, there are 762! So much so that they even sell souvenirs with the saying Father 762! If you’re feeling light-headed when there’s a lot of curve, do not forget to take a Dramin before the trip! I think the best tip to not get sick is to go sleeping in the van! You can take the traditional bus too, it costs half the price (78 baths), but the last hour is there at eleven in the morning, and often a lot (and you have to go to the bus station to buy, spending a 100 baths in a taxi collective). Even if you split the cab and pay for 20 baths, the economy in the end is not that big, and I’ll tell you one thing: the van is five hundred times better than the bus! On the way I went by van, and on Father’s return I ended up going to Chiang Mai again. I wanted to go straight to Laos or to Chiang Rai, but there is no road linking Pai to the north, to the sides of the border! You need to get back to Chiang Mai, and then head north! The bench for two people is mega squeezed and hard, the road is just curving all the time, you spend 4 hours unable to sleep anything, falling on your neighbor or squeezing it against the wall … Aff … I think sitting at the window is Better, because you have an option to support the head to try to sleep, but the disadvantage is that you are crushed against the window at all times with the curves! There are some individual seats in the front, I think they are the best. The places are marked, but nobody cares, so the scheme is to arrive early! I figured in the end, the economy did not make up for it! The Pai (mini) bus station is in the middle of the centrinho, it is easy to walk to the main hostels. Oh, another option is to rent a motorbike in Chiang Mai and return it to Pai yourself – you pay the normal rental price (140 baths), + a fee to take her back to Chiang Mai. I stayed in a very nice place, about 15 minutes walking from the center (and the bus station). I went there with 4 friends I met at the hostel in Chiang Mai, and we had no idea where to stay. When we arrived at the bus station, a guy (Australian) came to talk to us and offer lodging. But his approach was so cool, without forcing the bar, that we went there to see what the place was like. And he even took the tuk tuk people there, without charge (and would take people back later, if we did not like them). Summary of the story: the hostel is called Happy House, and is super cool. It has options for dorms, bungalows and “mini-houses” – we stay in one of these “houses”. It was a very large room with 4 beds (he added another mattress), with private bathroom (and hot shower), with refrigerator, TV and a huge balcony, great to stay there chatting and having a drink. The room cost 800 baths, gave 160 for each (about 12 reais)! To see all the hotels and guest houses in Pai, click here. And by booking here you help keep the blog on the air, without paying anything for it! Thanks! 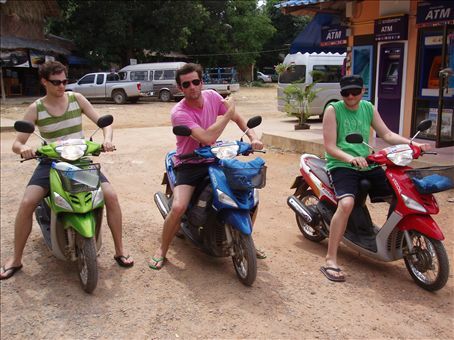 One thing very common in several cities of Thailand is to rent a motorcycle to spend the day, and in Pai it is not different. When it is high season (Jan / Feb) and near the end of the week, it is quite difficult to get one available – and it looks like there are many places that rent there! Three on the motorcycle! Three on the motorcycle! We rented two bikes at Aya Service, but we almost did not get it from so many people! The daily cost 140 baths (about 11 reais), and you make a deposit of 100 baths by the helmet (get it back when it returns). You can also rent a bike for 50 baths / day (about 3.50 reais! ), But there are several places where it is difficult to get with it because they are farther away and full of climbs. If you know how to drive a bike, it is worth renting and getting to know various things about the area, it is well taken care of! Thailand – Daddy – Pancakes LexyThe sweet pancakes are delicious (Nutella with banana and strawberry … Hmmm), but the same winner was the salty one! She puts cheese, bacon, onions, peppers and various spices, gets mega special! If you go to Father, do not forget to eat Lexy’s pancake! And tell her I sent you a kiss! Rs … She is close to the bus station, on the tourist street, near a Seven Eleven (market). Pai’s nightlife is not too hectic, as you would expect, but in some bars that stay open late. Don’t Cry is the last to close, and it’s pretty cool. It rolled a festival of reggae very mass in one of the days that I was there, and from time to time happen music festivals. And Dad is pretty much the only Thai town that respects the law that prohibits the sale of alcohol after midnight (except in bars)! Pai is very touristy, so there are several shopping options. There are those with the clothes and souvenirs you find everywhere in Thailand, but there are also some very different things. The shops are concentrated on Walking Street and the cross street, the bus station, which are basically the centrinho of Pai. My idea was to go from Pai straight to Chiang Rai, which is further north of Thailand, and then from there to Laos. Beautiful in theory, but impossible in practice … There simply is no road linking Pai to Chiang Rai … You can close a tour from there to Laos or to Chiang Rai, but you will pass through Chiang Mai first … Until Chiang Rai Agencies charge about 500 baths (about 40 reais), and about 1100 to Vang Vieng, and 1500 to Luang Prabang. Big money, right! There are cachus, canyon, caves, lookouts … A lot of stuff to do! So much that has an entire post just about it, check it out here! At night, the main street is full of stalls with different foods from the rest of Thailand. There is more Muslim in the city (this you only discover at night) and I think that’s why the gastronomy is diversified. Lucky us that we can leave from tent to tent eating everything baratex that gives desire. After I had eaten everything, I would go back to my hostel with a delicious little restaurant open and there I would have a Thai beer or a wine – look! There was wine in Thailand! In Pai you have no commitment to anything, nothing to see. There are some waterfalls (I did not mention that it was equal to Minas), warm waters and rafting to do. But seriously, if you do not do that, you’ll be very happy. I confess that I had a nice lazy days of touring in Pai. I wanted to take a few days not to do this and just be silly, driving my bike from side to side, reading a book, writing. Have any doubts? let you answer in the comment bellow, I will be glad to answer all.